One of Philadelphia’s greatest treasures, the Wanamaker Organ is the largest functioning musical instrument in the world. With 28,750 pipes, it is the second largest organ in the world (behind Atlantic City’s Boardwalk Hall), 80% of which are still functional. 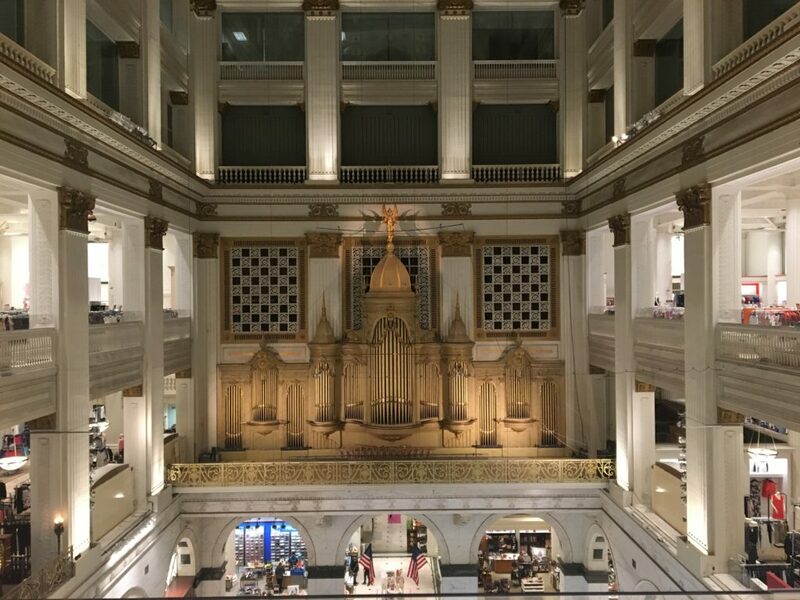 The organ was originally built for the 1904 World’s Fair in St. Louis, and was purchased by John Wanamaker shortly thereafter for his new department store. Its first concert was held in 1911 to celebrate the crowning of King George V in England. Over the years, it has attracted organists and composers from around the world, including Louis Vierne, Alexandre Guilmant, and Marcel Dupre. Several works of music have been written specifically to be played on the Wanamaker Organ, and transcriptions of existing works have as well. Daily concerts are held Monday through Saturday on the Wanamaker Organ, most by Peter Richard Conte, the current organist. A few special concerts are held throughout the year. Wanamaker Organ Day is held on the first Saturday of June, and features concerts throughout the day. The store itself, now Macy’s Center City, is also notable. The store has a 7-story atrium, where the organ is located. It is a fine work of architecture as well. The eagle statue in the courtyard was a popular meeting place for Philadelphians for ages.